#Aging is trendy! So we’ve been told. And how can #aging not be a positive trend when one thinks of and is so frequently and sadly reminded of the alternative . I, hereby, submit to you three of the most inspirational and MOST TRENDY people that have recently been in the news. Then she laughed. “But I’ve been blessed and cursed with incredible energy,” she said last week. “I’ll never stop.” This quote comes from The New York Times article below. 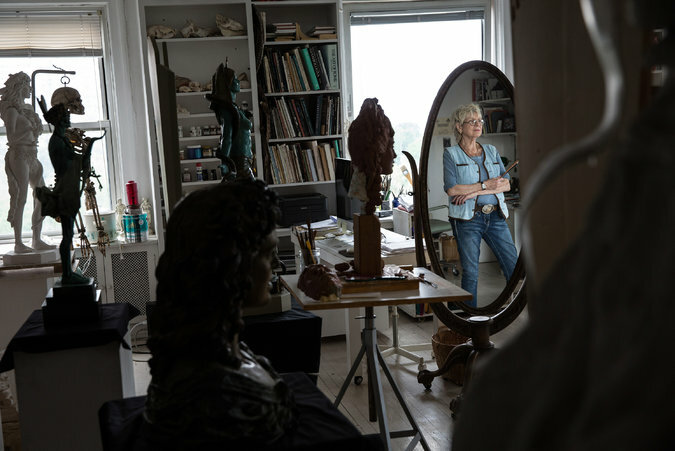 The article was written in conjunction with Ms. Flack’s recent show at age 84 the Hollis Taggart Galleries on the Upper East Side of Manhattan. Her show, “Audrey Flack: The Abstract Expression Years,” closed June 6. “Every hand at the Mission Valley Aquatic Center that Saturday morning erupted in applause as Charlotte Sanddal finished her mile swim. The 92-year-old from Helena finished those 1,650 yards in 58 minutes, 35 seconds — slowest of any of the mile swimmers at the Montana State Masters Swim Meet held in Polson a weekend ago — but she ground out every yard. She even did flip turns at every wall. Not too shabby for some 92-year-old bones.” Charlotte didn’t begin to swim competitively until age 72! May YOU become Inspired, too!